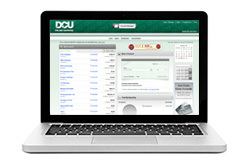 When you log into Online Banking from the DCU homepage, your member number and password are sent from your computer to ours using Extended Validation 128-bit Secure Socket Layer (SSL) technology. SSL encrypts your personal information before it leaves your computer, ensuring that no one else can read it. See Key Encryption below. Transmissions between your PC and the Online Banking file servers are encrypted or scrambled so only those two computers can decipher them. Browser software with a minimum of 128-bit strong encryption is required. You cannot access Online Banking unless you are using a browser equipped with encryption technology (also known as SSL or Secure Socket Layering). This is important if you are accessing your accounts from your office or a public location where people would have access to the computer if you walked away without closing your session. Online Banking assigns a session ID number each time you log in. Cookies must be enabled on your browser so it will accept this ID number and this session can begin. This number is verified each time you send or receive information from the Online Banking host processor during that session. The cookie is not stored on your computer and it is dismissed when you exit Online Banking, or are automatically logged out for inactivity. Typically, internet pages you recently visited are stored in a cache on your computer so they load faster when you return to them. The account information pages in Online Banking are set up so they cannot be stored in your computer´s cache. This is so the pages you've looked at are no longer on your computer after you log off. If you walk away from your PC at work, for example, no one can use your browser´s back button to view account information after your session is over. If someone has discovered your member number and tries to guess your password, the third incorrect password entry in a row (without a successful login) immediately blocks Online Banking account access by electronic services to your member number. You have to tell us to unlock it. As an added measure of security, you will be required to change your standard DCU PIN the first time you log in to Online Banking. You must use any Alpha-Numeric combination (at least one of each) with a minimum of 8 digits and up to 18 characters long. Blank spaces cannot be used. Never disclose your PIN or password to anyone  not even us! No one at DCU knows your PIN or password and no one at DCU will ever ask for it. If you forget or lose it, let us know. Our data processing system will print you a new copy in a sealed mailer. No one will see it until you open it.